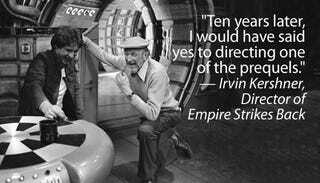 Irvin Kershner directed the greatest Star Wars movie of all, The Empire Strikes Back. It may be time to forgive George Lucas, but it's hard not dreaming about the saga of Anakin's rise and fall depicted by more capable hands. In an interview coinciding with Empire's 30th anniversary, Kershner reveals that, had the prequels been made 10 years after the original series, closer to when Lucas had originally planned, he would've agreed to directing one of them. Much of the interview is about the disconnect between how critics and fans saw the film in 1980 when it was originally released—reaction was mixed, to say the least—and how it's perceived today, as the high point of not just the original trilogy, but the entire Star Wars series. But he also talks about the toughest scene to shoot in Empire, and why we should have a little more confidence in Lucas's plan to convert Star Wars to 3-D.